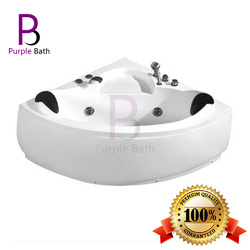 Our product range includes a wide range of pavel jacuzzi corner massage bathtub, afran jacuzzi massage corner bathtub, osip jacuzzi massage corner bathtub, klera corner jacuzzi massage bathtub, elisa corner jacuzzi massage bathtub and white corner bathtub. Dimension 52" x 52" x 27" inch. Size 52" x 52" x 27"
The high walls and deep, Pavel Jacuzzi Corner Massage Bathtub are the perfect compliment to its timeless, classic style. Its construction and the thickness of walls provide for excellent heat retention and durability. The premium heavy gauge, sanitary-grade precision acrylic and its color is consistent throughout – not painted on – and thus will not fade or lose its brilliance over time. This tub is designed for one or two person bathing, and is extra deep, perfect for a full-body soak. Furthermore, the Pavel Jacuzzi Corner Massage Bathtub boasts an ergonomic form that fits to the body for ultimate bathing comfort. Size 54" x 54" x 24" inch. 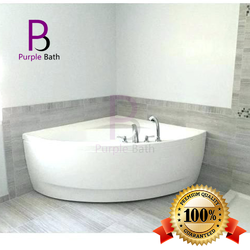 The Purple Bath Afran Jacuzzi Massage corner Bathtub is a contemporary and timeless, acrylic designed model, perfect for small or large bathroom corners. This bathtub comes with twin sitter which is perfect for two people. Afran Jacuzzi Massage corner Bathtub unique and ergonomic interior provides bathers with comfortable and long body soaks. Crafted using premium acrylic sheets, this tub presents thick walls that provide unparalleled heat retention and durability. 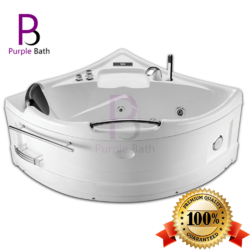 The Afran Hydro/air massage whirlpool Corner bathtub from Purple Bath is made from reinforced acrylic and Fiberglass Resins for unrivaled strength and longevity. It is offered in a range of finishes, which can be chosen to blend with your bathroom decor or color scheme. This bathtub has six adjustable comfort hydro jets with side-mounted on/off control for hassle-free operation. 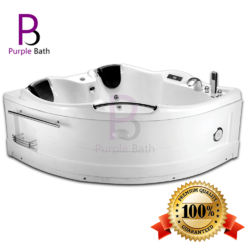 It has a deep soak overflow drain, which offers maximum water depth and complete immersion, to enjoy a warm and refreshing bath. This bathtub also features a quick connect heater system(Optional), which allows you to warm the water at the desired temperature. It also has a 1.0 HP Blower with 12 Air jets, which creates air bubble in the tub for bubble massage therapy. Dimension 60" x 60" x 28"
The high walls and deep, Osip Jacuzzi Massage Corner Bathtub are the perfect compliment to its timeless, classic style. Its construction and the thickness of walls provide for excellent heat retention and durability. The premium heavy gauge, sanitary-grade precision acrylic and its color is consistent throughout – not painted on – and thus will not fade or lose its brilliance over time. This tub is designed for one or two person bathing, and is extra deep, perfect for a full-body soak. Furthermore, the Osip Jacuzzi Massage Corner Bathtub boasts an ergonomic form that fits to the body for ultimate bathing comfort. The high walls and deep,Klera Corner Jacuzzi Massage Bathtub are the perfect compliment to its timeless, classic style. Its construction and the thickness of walls provide for excellent heat retention and durability. The premium heavy gauge, sanitary-grade precision acrylic and its color is consistent throughout – not painted on – and thus will not fade or lose its brilliance over time. This tub is designed for one or two person bathing, and is extra deep, perfect for a full-body soak. Furthermore, the Klera Corner Jacuzzi Massage Bathtub boasts an ergonomic form that fits to the body for ultimate bathing comfort. 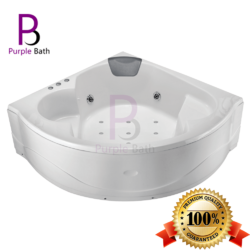 We are a well-known firm of Elisa Corner Jacuzzi Massage Bathtub. In addition, quality experts also check the quality of this product under varied industry standards. Besides, we offer this product at nominal costs. 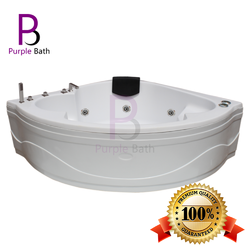 We are offering a wide range of Miran Corner Jacuzzi Massage Bathtub with Deep Corner. Lucian Jacuzzi Massage Corner Bathtub is a modern and aesthetically pleasing bathtub with a deep and ergonomic interior. A powerful 1.5HP pump delivers a six-jet back massage, or you can use the mechanical diverter to divert water pressure from back massage nozzles to the foot massage or side massage nozzles. The bath filler with thermostatic valve and built-in hand shower are optional extra items for the corner bathtub.